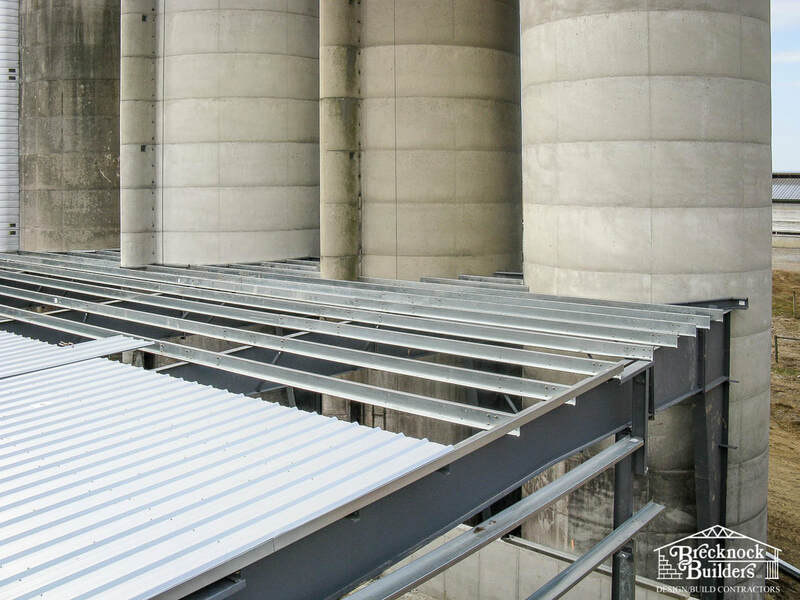 Brecknock Builders is here to help you design and build your equipment storage facility. Whether that's an overside pole barn for a few tractors and combines, or giant pre-engineered steel buildings with clear spans of 100 plus feet! Scroll down for a case study from a past project. Because your equipment is the backbone of your business, we want to help you project your investment so that it can continue to serve you for years to come. When Mr. Horning, a farmer from Lebanon, PA, grew to the point he needed an open-front building to shelter his equipment, he began to explore his options. He knew he wanted it to go between his barn and his cluster of silos, but how to maximize the space? At first Mr. Horning explored a wood-framed building. But because he needed one hundred feet of clear span without any posts or beams in the way, wood was not an option. Plus the roof on the wood-framed building could not have a low enough slope to meet the existing barn roof. So, wood was not going to work. He would have to try steel. That's when Mr. Horning called Brecknock Builders since they have decades of experience in the pre-engineered steel construction industry. And through talking with the estimators and designers, Mr. Horning came to the conclusion that a steel building would be a perfect fit. Literally. He wanted 100' clear span. Steel gave him a 100' clear span. He wanted a low-slope roof to fit under his barn roof. Steel gave him a low-slope roof. He wanted to fit it between his barn and the silos. 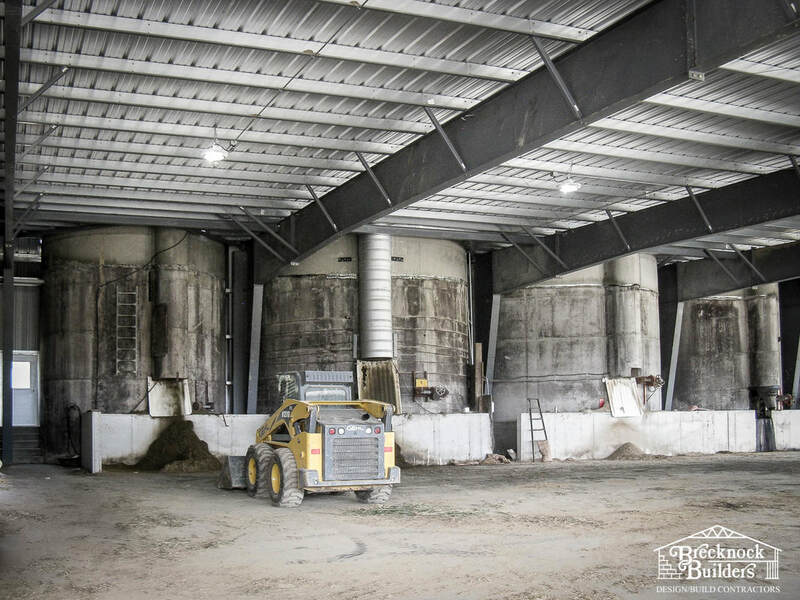 The craftsman at Brecknock Builders customized the building to wrap around each silo. That was, no doubt, the most complicated part of the project. It may have been difficult to get the necessary supports around the silos, it may have been challenging to get a crucial, water-tight seal, and it may have been troublesome to compensate for the slope of the existing concrete grade - some may have even said the project was impossible - but Brecknock did it. Today, Mr. Horning can use and enjoy his new equipment storage building that was custom-made to his unique needs.